Onto the pretty big tin; Benefit’s Complexion Confections Gift Set. What should have originally been £39.50, and a value of £61.35, I bought it for the bargainous price of £26.33. Inside is a full size Triple Performing Facial Emulsion and It’s Potent! Eye Cream, and a mini POREfessional and Instant Comeback Facial Serum. I cannot wait to try these out! Next up is one for the handbag; a mini Umberto Giannini Catwalk Beauty Hairspray and sparkly confetti nail varnish. 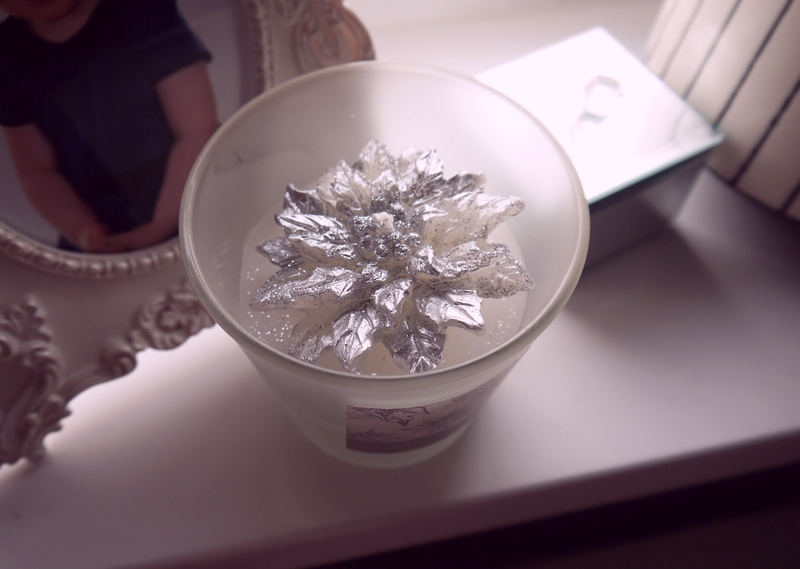 And finally, a super pretty Decorative Poinsettia Candle for £3.50; cos you can never have enough candles. I’ll be back tomorrow for my NYE Party Prep post! So that’s what I picked up on Boxing Day! Have you grabbed anything from the sales yet? What a great post 🙂 So many great bargains! Love the smell of the One Direction perfume too! I love the candle, looks really cute.